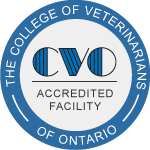 Welcome to Orchard Grove Animal Clinic, located at 397 Old Orchard Grove in Toronto, Ontario. Orchard Grove Animal Clinic offers a wide variety of services. Please visit our Services section for more details.